18 Fairfield is located on the east side of Fairfield, between Marlborough and Commonwealth, with 276 Marlborough (16 Fairfield) to the north and 20 Fairfield to the south. 18 Fairfield was designed by Peabody and Stearns, architects, and built in 1878 by Vinal & Dodge, masons, and Hancock & Greeley, carpenters, as the home of Charles Edward Grinnell and his wife Elizabeth Tucker (Washburn) Grinnell. They previously had lived in Cambridge. Elizabeth Grinnell is shown as the owner of 18 Fairfield on the original building permit application, dated April 19, 1878. 18 Fairfield was numbered as 10 Fairfield until about 1881. Plans for the house are included in the Peabody and Stearns Collection in the Boston Public Library’s Arts Department (reference PS/MA.070). Click here to view the original plans for 18 Fairfield. 18 Fairfield, front elevation, excerpt from drawing by Peabody and Stearns (1878); courtesy of the Boston Public Library Arts Department. Elizabeth Grinnell purchased the land on which 18 Fairfield was built on April 15, 1878, from Carrie E. (Ellis) Evans, the widow of Franklin Evans. It was part of a larger parcel originally purchased from the Boston Water Power Company on February 16, 1863, by Daniel Davies, Jarvis Dwight Braman, and Grenville Temple Winthrop Braman. Grenville Braman was treasurer of the Boston Water Power Company, Jarvis Braman was his brother (and later president of the company), and Daniel Davies, a housewright and master carpenter, was Grenville Braman’s father-in-law. 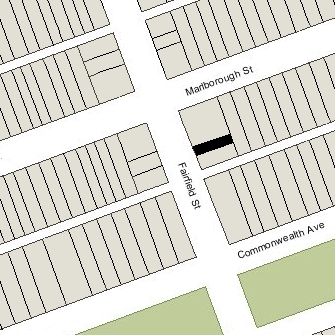 Both the lot at 18 Fairfield and the abutting lot to the south, at 20 Fairfield, included a three foot wide easement at their eastern boundaries, providing a passageway for access to the alley for them and for the lot further north at 16 Fairfield. Click here for an index to the deeds for 18 Fairfield and for a plan of the original land. Charles Grinnell was a former Unitarian Minister who resigned from the pastorate in December of 1873, attended Harvard Law School, and became a lawyer in Boston. 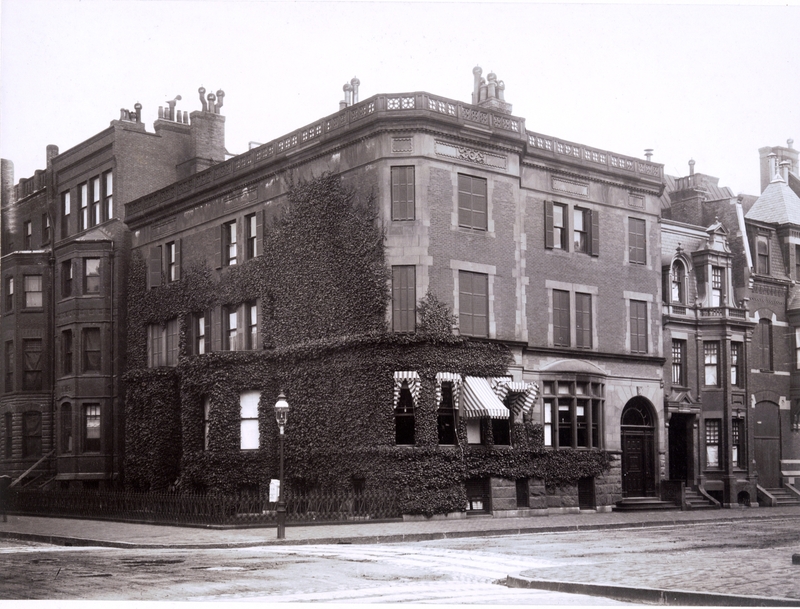 The Grinnells continued to live at 18 Fairfield in 1884, but had moved to the Hotel Oxford (southeast corner of Exeter and Huntington) by 1885. They continued to own 18 Fairfield, leasing it to others. Elizabeth Grinnell died in January of 1910, and Charles Grinnell died in February of 1916. 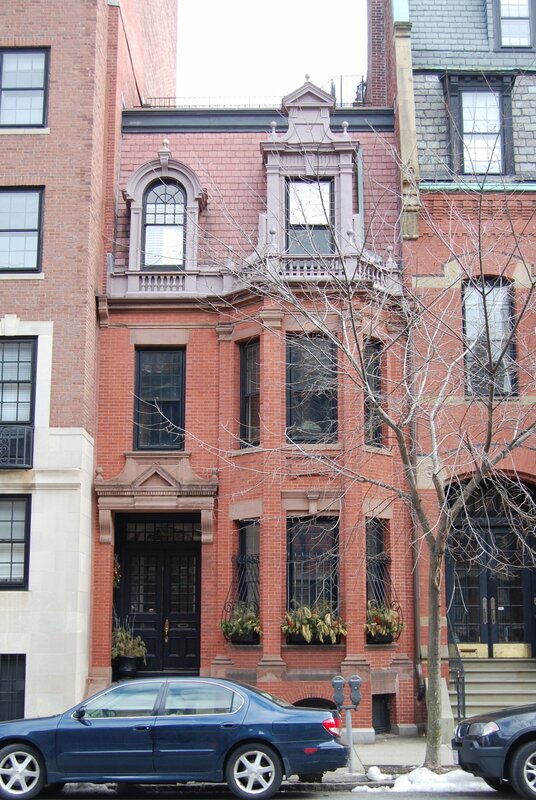 By the 1884-1885 winter season, it was the home of real estate broker Thomas Nelson and his wife, Annie (Bigelow) Nelson. They had married in October of 1884 and 18 Fairfield probably was their first home together. They continued to live there during the 1885-1886 season, but moved thereafter to 29 Hereford. By the1886-1887 winter season, 18 Fairfield was the home of George Fox Tucker, an unmarried lawyer and author. He previously had lived 62 Clarendon and before that at 12 Gloucester. Living with him was his sister-in-law, Mrs. Mary Randall Ellis (Bourne) Tucker, the wife of Charles Russell Tucker, Jr.
By the 1887-1888 winter season, they had been joined at 18 Fairfield by Dr. Beverly Oliver Kinnear, a physician, and his wife, Elizabeth Howell (Van Cleef) Kinnear. Dr. Kinnear also maintained his office there. They previously had lived at the Hotel Oxford (southeast corner of Exeter and Huntington). Elizabeth Kinnear died in August of 1888 and Beverly Kinnear moved soon thereafter. The Tuckers also moved in about 1888, he to 7 Copley and she probably to New Bedford, where her husband died in February of 1891. By the 1888-1889 winter season, 18 Fairfield was the home of Mrs. Harriet (Ames) Mitchell, the widow of Asa Mitchell. She continued to live there until her death in December of 1896. By the 1897-1898 winter season, 18 Fairfield was the home of Mrs. Elizabeth Gray (Story) Gray, the former wife of cotton buyer Edward Gray. 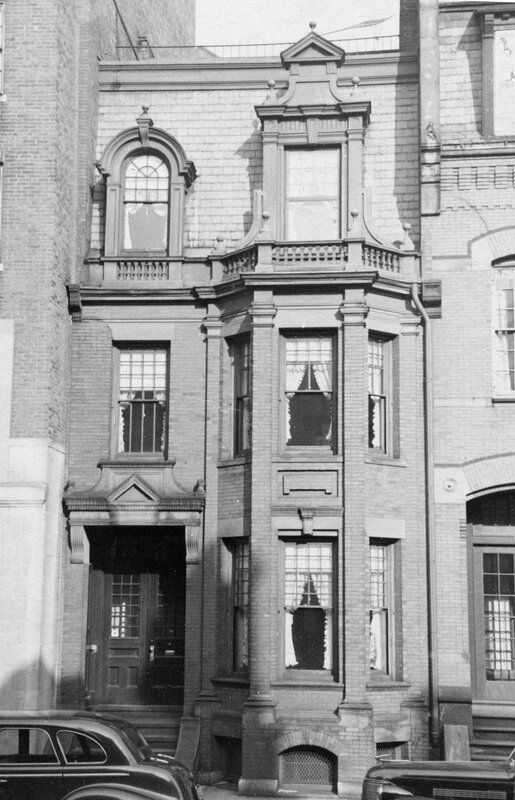 She continued to live there in 1899, but by 1900 had moved to the Hotel Ludlow (southwest corner of Clarendon and St. James). By the 1899-1900 winter season, 18 Fairfield was the home of real estate broker George Lewis DeBlois, III, and his wife, Mary Bartlett (Brooks) DeBlois. They had married in November of 1899, and 18 Fairfield probably was their first home together. He had lived briefly at the Hotel Hamilton at 260 Clarendon prior to their marriage, and at 253 Beacon prior to that. They continued to live there in 1904. By 1905, they had moved to 346 Marlborough. By the 1904-1905 winter season, it was the home of architect J. Harleston Parker and his wife, Edith Value (Stackpole) Parker. They had married in September of 1904 and 18 Fairfield probably was their first home together. Prior to their marriage, he had lived at 118 Marlborough with his mother, Adeline Ellen (Reynolds) Parker, the widow of Harleston Parker. The Parkers continued to live at 18 Fairfield in 1906, but had purchased and moved to 289 Marlborough by 1907. By the 1906-1907 winter season, 18 Fairfield was the home Dr. John Lewis Bremer, Jr., professor of histology at Harvard Medical School, and his wife, Mary Cleveland (Bigelow) Bremer. They had married in September of 1906, and 18 Fairfield probably was their first home together. Prior to their marriage, Dr. Bremer lived at 416 Beacon with his mother, Mary Rice (Farnsworth) Bremer, the widow of John Lewis Bremer. The Bremers continued to live at 18 Fairfield in 1908, but had moved to 10 Fairfield by 1909. By 1909, 18 Fairfield was the home of Miss Katherine (Kate) A. Whitney, daughter of lumber merchant and real estate investor Charles Whitney. She previously had lived at the Hotel Vendôme, which her father had purchased and expanded in the early 1880s. Kate Whitney and her sister, Ada Medora (Whitney) Davis, the wife of George Gilbert Davis, inherited the hotel from him and continued to own it. Kate Whitney died in October of 1909. By the 1909-1910 winter season, it was the home of Joseph Gardner Bradley and his wife, Mabel Bayard (Warren) Bradley. Joseph Bradley was a lawyer and president of the Elk River Coal and Lumber Company, a coal mining company in Widen, West Virginia. They continued to live there during the 1913-1914 winter season, but moved thereafter to 312 Beacon. 18 Fairfield was not listed in the 1915 and 1916 Blue Books. On June 14, 1916, 18 Fairfield was purchased from the estate of Charles Grinnell by Corinna Searle, who probably purchased it in anticipation of her upcoming marriage to Harold Damrell Walker. She lived at 280 Commonwealth with her parents, attorney Charles P. Searle and Cora (Hogg) Searle. In the same month as she purchased 18 Fairfield, Corinna Searle applied for (and subsequently received) permission to remodel the house, including adding a story over a portion of the house and adding an ell at the rear. The remodeling was designed by her future father-in-law, architect Charles Howard Walker. In September of 1916 she married Harold Walker, an architect in his father’s firm, and they made 18 Fairfield their home. The Walkers separated in about 1929. 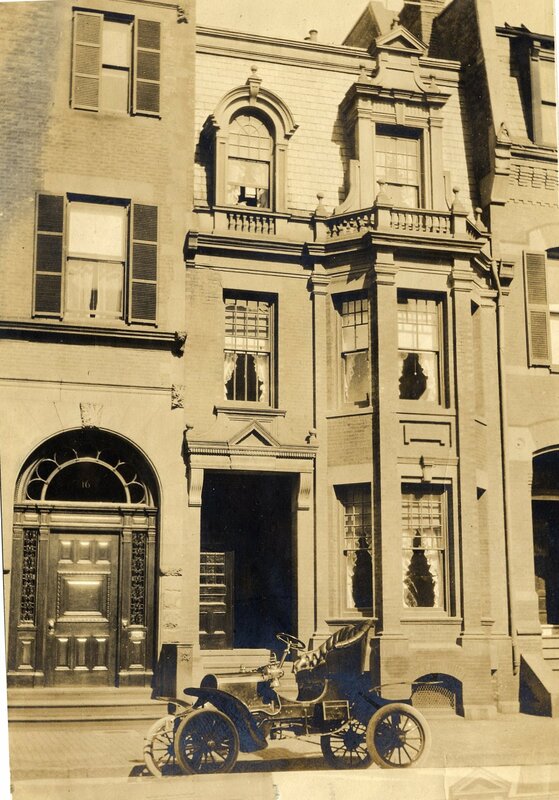 She continued to live at 18 Fairfield in 1930 and was proprietor of a millinery store, The Bandbox, at 227 Newbury. By 1931, she had moved to Brookline. On June 11, 1930, 18 Fairfield was purchased from Corinna Walker by Marie Francoeur (Brewster) Johnson, the wife of insurance broker Laurence Henry Hitch Johnson, Jr. They previously had lived in an apartment at 6 Marlborough. They also maintained a home in Marblehead. They continued to live at 18 Fairfield until about 1942, when they moved to Brookline. On September 30, 1941, 18 Fairfield was purchased from Marie Johnson by Mary (Gall) Markham, the wife of Reuben Henry Markham. They previously had lived in an apartment at 389 Commonwealth. An ordained Congregational minister, Reuben Markham was an author, lecturer, and journalist. He served as Balkan correspondent for the Christian Science Monitor. In about 1948, the Markhams were joined at 18 Fairfield by Miss Jane Frost Rutherford, who worked for the Christian Science Monitor. Reuben Markham died in December of 1949. Jane Rutherford married in 1950 to Eric William Essen and moved elsewhere. Mary Markham moved at about the same time. By 1951, 18 Fairfield had become the home of Jane Rutherford’s parents, Harry Kugler Rutherford and Susan Belle (Rector) Rutherford. They previously had lived in New York. Harry Rutherford was no longer listed there in the Lists of Residents after 1952, but Susan Belle Rutherford continued to live there until about 1959. By 1963, she was living in North Attleboro with her son-in-law and daughter, Eric and Jane Essen. On September 30, 1959, 18 Fairfield was purchased from Mary Markham (by then living in Washington DC) by Genevieve S. (Reilley) Harrigan, the wife of attorney Earle F. Harrigan. They previously had lived at 288 Newbury. On March 14, 1961, she transferred the property into both of their names. On September 17, 1977, Robert C. Nelson and his wife, Nancy C. Nelson, purchased 18 Fairfield from Earle and Genevieve Harrigan. On October 27, 1980, Jonathan Bangs and his wife, Beverly Scott Bangs, purchased 18 Fairfield from Robert and Nancy Nelson. In December of 1981, they applied for (and subsequently received) permission to add a one-story kitchen addition at the first story level, on top of the existing ell. On September 15, 1994, Scott M. Grenert and his wife, Danielle M. Grenert, purchased 18 Fairfield from Jonathan and Beverly Bangs. The property subsequently changed hands. 18 Fairfield remained assessed as a single family dwelling in 2015.